Why do bad things happen to good people? This might be the most-asked theological question in the world, and you’ve probably asked a variant of it yourself at some point. This week we start a short series on the ‘minor’ prophets, the short books at the end of the Old Testament. We begin with Habakkuk – one biblical name that hasn’t had a surge in baby-name popularity – who is having a pretty robust discussion with God about this big question. As I was reading it yesterday I thought this might be a good month to try a free range preaching experiment, where we have a discussion through the week that shapes the direction my sermon goes in. Here’s what I’d like us to do. Our discussion will guide what direction we go in on Sunday. Here are some thoughts from me to get you started. Chapter 1 (ish): the prophet describes the awful things he sees around him and asks why God would let good people suffer at the hands of the violent. Chapter 2 (ish): God replies, including five ‘alas!’ or ‘woe to him!’ sections, showing what will happen to the violent, the greedy, the oppressors, etc. Chapter 3: a psalm, complete with musical directions, singing of how powerful and amazing God is and how that is a source of comfort and strength for Habakkuk even when everything is going wrong. Can you think of a more powerful three-letter word in Scripture than the ‘yet’ in verse 18? If you were re-writing chapter 1 to refer to current events, what are the hard things you find most mystifying that God allows to happen? What injustice do you want an explanation for? I was really struck by the five ‘woe to him!’ sections in chapter 2. Which of the five draws you most and why? 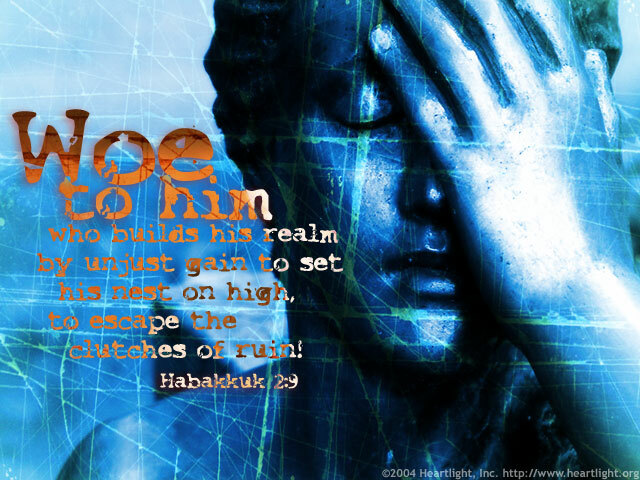 In chapter 3, what do you think was going on inside Habakkuk that he is able to end the way he does? Can you relate to his response to hardship? 2.I’m sitting on the fence and saying all of them. Anti alcohol Wayne would have said the drink one!! 3.His feelings weren’t controlled by the events around him but by his faith in God’s ability to give him strength. Well Thalia, how could you preach on my favourite book of the Bible when I am feeling fed up. Got the run around by ACC & OT Dept at Base??? Frustrating – BUT- ch 3 v 18 & 19 is stll true and relevant for me today. Looking forward to sermon. Love from me!!!! 1. Open any newspaper! Third World poverty: hunger, disease, child-labour, slavery, oppression; Drug trade: violence, sickness, greed, fear; Diseases and untimely death including cancer and AIDS; natural disasters; terrorism; child abuse…..
2. My version starts each section: “You’re doomed!” In other words there’s no hope for you! We can’t say we haven’t been warned. Good to take note of what riles God! His final judgment on nations and individuals alike will be truly fair and just – ultimate justice. 3. God has a right to be angry but thankfully he is also merciful and loving. When trouble strikes and things happen beyond our control sometimes all we can do is trust Him to see us through. Thank God! He sees the global wrong of the time where the majority are poor and oppressed by the few who gain by exploitation. Same today not so much in NZ though in a democratic country. Ghana where Bethany is a classic, has all the resources to be a wealth nation but centuries of oppressive leaders have kept all but a few poor. Thanks, Lyn, Alison and Murray. I’m starting writing this morning and will incorporate your responses – but plenty of room for more! Best sermon yet on Habakkuk and it still remains one of my favourites books in the Bible. It is good to be reminded that God is still in control and circumstances should not stop us from rejoicing n the Lord, the God of our salvation. Thanks Thalia, the whole servce was wonderful and I felt so blessed to have been there. Two of the hymns I had at Wayne’s funeral but even that seemed okay and reassuring of the faith he had in God.